530 pages | 27 B/W Illus. C. Michael Hall is a Professor in the Department of Management, Marketing and Entrepreneurship, University of Canterbury and Docent, Department of Geography, University of Oulu, Finland. 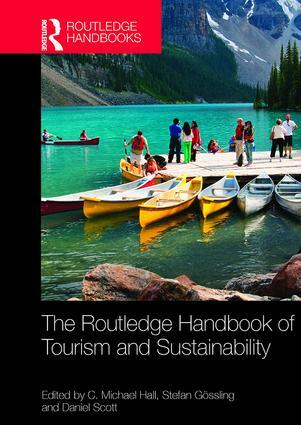 Co-editor of Current Issues in Tourism, he has wide ranging research interests in tourism, mobility and regional development, food, and environmental history. Stefan Gössling is a Professor at the Department of Service Management, Lund University and the School of Business and Economics, Linnaeus-University, Kalmar, Sweden, and research coordinator at the Western Norway Research Institute’s Research Centre for Sustainable Tourism. His research interests include tourism and climate change, tourism and development, mobility studies, renewable energy, low-carbon tourism, as well as climate policy and carbon trading. Daniel Scott is a Canada Research Chair in Global Change and Tourism in the Department of Geography and Environmental Management, University of Waterloo. His research interests include tourism and climate change, sustainable tourism, protected areas management and climate change, and tourism-recreation climatology.